Genre: 2D Roaming beat 'em up. 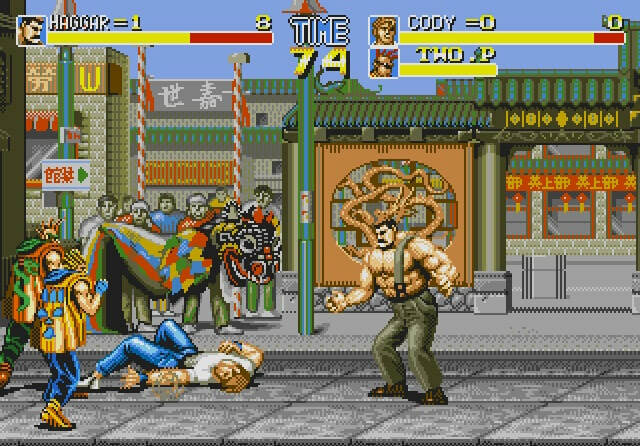 It's strange to think that, heading into 1993 and the latter stages of the 16-bit era, there was still no meaningful home version of Final Fight on the market. 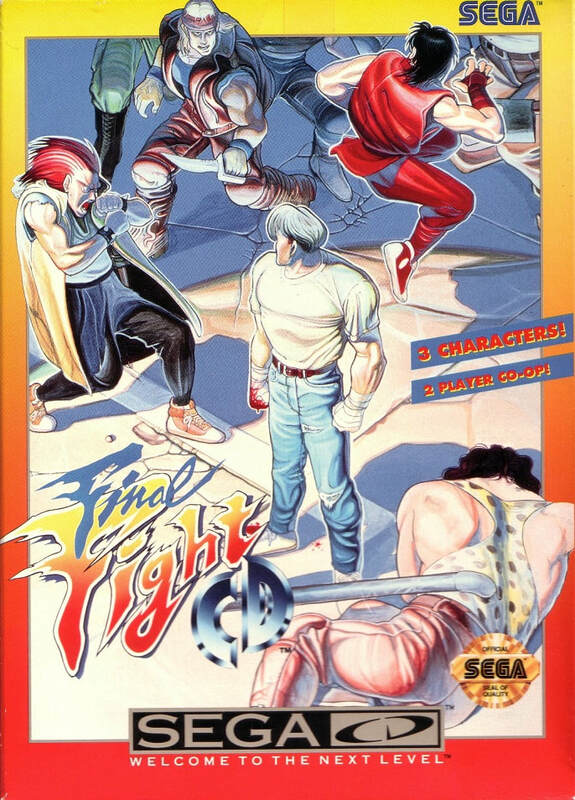 Whilst Streets of Rage and its own sequel had been lighting up the Mega Drive with scintillating co-op gameplay, it brought into stark relief the failings of Capcom's SNES port of Final Fight, which was short by one character, one level and, more importantly, supported one-player only, meaning a great chunk of its appeal was instantly void. Fortunately, however limited the audience numbers might have been, the Mega-CD version was brilliant. Set in the marvellously generic-sounding Metro City, mayor Mike Haggar is having a bad day. Street gang Mad Gear have kidnapped his daughter Jessica. Fortunately, like most city mayors, Haggar used to be a professional wrestler and so, with the help of Jessica's boyfriend Cody and his pal Guy, he must battle a small army of goons in order to secure her freedom. Cue six stages of glorious, high-octane fisticuffs. ​Final Fight CD's strongest assets are its design and its visuals; the game looks absolutely amazing. The quality of the enemies in particular is something to behold. There's a fantastic, colourful and diverse range of goons-for-hire with their funky hairdos and colourful jackets, as well as the memorable duo of Poison and Roxy, who dominate the screen with their lissom, dynamically animated flying-kicks. Andore makes for a towering, bear of an opponent who is slow but lethal thanks to his long reach and devastating throws. There are foes who flick knives across the screen, whilst others opt to dash molotov cocktails at the player's feet. This veritable carnival of street thugs makes for some of the most anarchic, visually splendid brawling of its time. The graphical panache is only enhanced by the quality of the levels, which the Mega-CD handles in fine style. Grimy back-alleys act as a nice appetiser, but things really start to hit top gear when the player reaches the subway and train sections of the second stage. 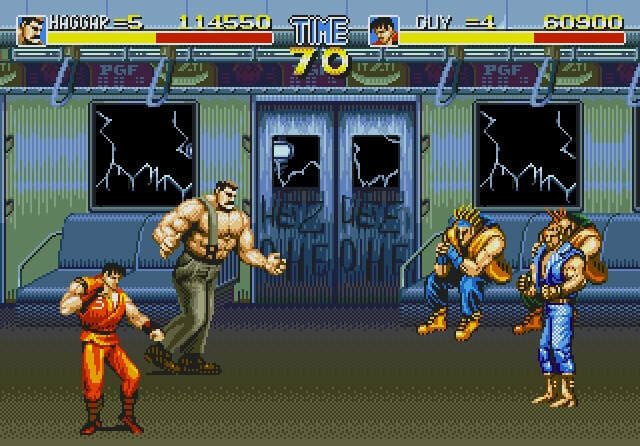 The carriages buffet as the scenery hurtles past; it marks the first implicit nod towards a game-as-action-film ethos that Final Fight CD succeeds in cultivating over the following stages. You'll pass through bars, decked out in their neon signs, to be met with a sea of onlookers observing from the fringes, seeing how the unfolding melee pans out. Haggar and co. then have to tough it out through parks, city streets and ultimately, Mad Gear's skyscraper headquarters. The variety is great, the quality consistently very high. Controls and moves are slightly more simplistic than those find in Streets of Rage 2, with less in the way of double-team options and no running or double-tap directional attacks. That said, in addition to the standard punch and jump buttons, there's flying kicks, grapples and the odd throw in the mix, as well as a special move (attack and jump simultaneously) which trades some health for an unblockable attack designed as a get-out clause in the event of being swarmed from all sides. This is a life-saver, as the one-player mode can become very tough under the weight of goons, who are excellent at encircling our beleaguered heroes. Unfortunately, player combos aren't as rapid as in the arcade game, meaning many of the more pain-free methods employed to defeat bosses or limit damage from multiple enemies are no longer available. ​Highlights come thick and fast, especially in the form of some of the bosses, some of whom would become stars in their own right thanks to the Street Fighter Alpha games. Fighting Katana (otherwise known as Sodom) makes for a tricky, tense affair, played out amidst the confines of a wrestling ring. Disarm him of his twin swords, and he's vulnerable. It becomes a game of cat and mouse; his rapid attacks and vicious, speedy counter-attacks render him a constant threat. A couple of stages later sees a frenetic boss battle on an elevator (...because every beat 'em up needs one!) with army guy Rolento. He mixes lightning speed with a nasty propensity for peppering the playing area with grenades. There's even the classic car-smashing bonus level, destroy it completely to elicit the goon's agonised cry of “oh, my car!”. One area in which the Mega-CD port can actually claim to trump the co-op is in the addition of a Time Attack mode, which essentially gives the player one and a half minutes to pummel as many goons into submission as possible. The more waves you vanquish, the tougher the foes that follow. There's no particular fanfare to the mode, but it's particularly good fun with a friend, plus there are three different backdrops, all rather luxuriant, dependant on the character you choose – Guy's night-time suspension bridge that overlooks a freeway is particularly evocative of action genre semantics of the time. Capcom put the CD function to good use through the addition of a cop-show narration to accompany the game's intro, as well a fantastic array of atmospheric tunes. BGMs offer all the wailing guitar, bass licks and synthy bops you could hope for of an early nineties crime caper. Grunts and growls are suitably meaty, as are the impact effects; nothing quite beats having Haggar hurl a henchman into a crowd of assailants, and to hear the stacked thudding of them hitting the deck, one by one. 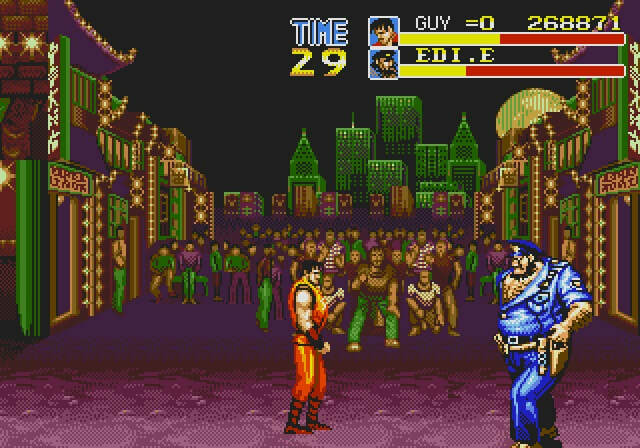 Even on the gentler of its skill settings, Final Fight CD represents a considerable challenge. Though you can opt to increase the life count to five on the options menu, this doesn't end up feeling like a significant cushion, due to the large quantities of damage dealt to you by opponents who are typically aggressive in their tactics. It's worth sticking with it however, as each level is a work of art, and crammed with action. Final Fight CD is a superb homage to a towering arcade experience. Surpassed by the Streets of Rage games by the time it landed on the Mega-CD in 1993, Capcom's classic nevertheless remained a rip-roaring effort, and one of the finest-looking 16-bit games on the market. Replete with memorable sections and an excellent co-op experience, Final Fight CD is a must-have for beat 'em up aficionados. "​Final Fight CD's strongest assets are its design and its visuals; the game looks absolutely amazing... Replete with memorable sections and an excellent co-op experience, it's a must-have for beat 'em up aficionados."